Rainbow Rowell has become synonymous with subtle yet powerful stories that really make readers believe in love, no matter how unconventional it may appear at first. 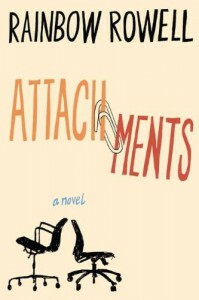 Attachments is her debut novel and is an adult contemporary romance that is set in that intriguing time of the end of the twentieth century and the beginning of the twenty-first century. Lincoln O'Neill, an IT worker at a newspaper whose main job duty is to reader workers' emails that have been flagged as inappropriate, is the protagonist. He is years removed from college and still isn't sure what he wants from his life. So, while he claims to be figuring it out, he works the graveyard shift at the newspaper and lives with his mother. While there is a small amount of romance, Lincoln's development from unassuming tech worker to confident man is the main focus of the book. I loved his character and found him very relatable with his devotion to his family, his discomfort with normal social situations, and his joy in playing Dungeons and Dragons with his long-time friends. Until the end, readers do not meet Beth and Jennifer outside of their email exchanges. I thought this was a genius way to help us understand how Lincoln could fall for someone without ever seeing them or having a conversation with them. I found myself fully invested in Jennifer's indecision regarding children, Beth's issues with her commitment-phobic boyfriend, and their genuine friendship. Another plot point of Attachments is the end of the twentieth century and the phenomenon known as Y2K. As someone who clearly remembers this time period, I couldn't help but laugh at the paranoia going around the technology department. It was just interesting to read a book that deliberately takes place in a specific year that isn't too far from the present. I thought the setting helped set the tone of the whole story with the email policing and the unknown associated with the impending new year. Overall, I found this book to be an absolute joy to read! The characters were richly detailed and so easy to relate to. The plot moved along at a slow pace, but it never felt like it was dragging. The romance (while it wasn't the focus) was very sweet and fit with what I knew of Rainbow Rowell's writing style. I highly recommend this for anyone who wants to try a Rainbow Rowell novel or is just into an unconventional look at romance at the beginning of the Digital Age.